Long hours spent on your feet can sometimes make nursing feel like a thankless job. 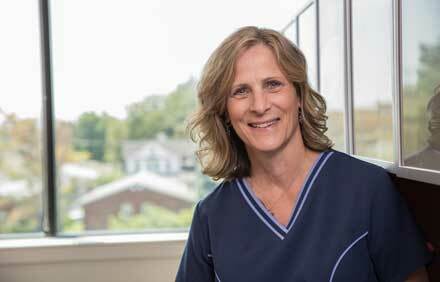 But for Sue Smolenski Burke, BSN, RN, OCN, her love for her patients is what gets her up in the morning and what keeps her going during those long days. Sue recently celebrated 34 years as a practicing nurse – 31 at Fox Chase Cancer Center. The third of four children raised by a loving family in Northeast Philadelphia, she pursued a career as a secretary in the insurance industry after graduating from high school. But, Sue soon realized she was not the type of person to work at a desk job and went on to become a medical assistant. Sue Smolenski Burke, BSN, RN, OCN, recently celebrated 34 years as a practicing nurse. “I was intrigued by medicine, I guess from watching all of the Marcus Welby, MD, episodes when I was young,” she said. Following her graduation, Sue was introduced to the nursing profession after speaking with a registered nurse, who encouraged her to register at Hahnemann Nursing School's Associate’s Degree Program. Her first job following completion of the program was at Graduate Hospital on the gastroenterology floor. Today, the married mother of two sons works with two extremely busy surgeons, Drs. Robert Uzzo and David Chen. Her days consist of running clinics, adjusting physician schedules, and prepping and working on procedures. She also has responsibility for the day-to-day workings and troubleshooting of the urology unit. Sue is a member of the Oncology Nurses Society and Society of Urologic Nurses and Associates, where she presents to others in her field. While she’s not helping her patients, she is busy with her rescue dogs (three right now), and enjoys reading, gardening, cooking, traveling, and listening to music. Why does Magnet® designation matter to you?